The Carrara Castle (Castello Carrarese) is one of the most important historical, architectural, artistic and military heritages of Padua. This antique building is on the same site that once held a castle constructed by Ezzelino III da Romano, tyrant of the city from 1237 to 1256, as a defensive pivot of the 13th century walls. The most evident trace of the old castle is the Torlonga, the larger of its two towers. After the fall of the tyrant the fortifications were abandoned until the da Carrara family came to rule the town, had the Castle reconstructed, and the two towers painted in white and red checks, as Giusto de' Menabuoi depicted them in 1382 in his fresco of the city painted in the chapel of the Blessed Luca Belludi in St. Anthony's Basilica. The entire castle was decorated, inside and out, as emerged during the restoration works of the last 10 years. There are still visible traces of vivid red and white in the remotest corners of the Observatory (the Specola) that was later built on that castle. The castle was connected to the Carrara Royal Palace (Reggia Carrarese) by an overpass that linked the political and the military centres of power. 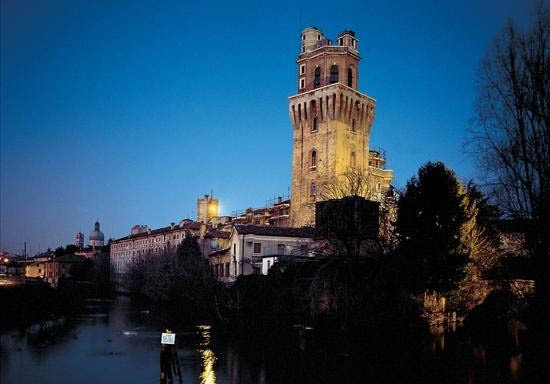 With the construction of the Renaissance city walls e after a long period of peace under the rule of the Republic of Venice, there was less need for the Old Castle of Padua, as people used to call it in the 18th century. The Republic of Venice contemplated the construction of a New Castle on the east side of the walls, but there remain only a few bastions of this project. The date and the paternity of the new 14th century castle had its first confirmation with the recovery, around 1810, of a well in the large courtyard of that portion of the castle that had been turned into a prison at the beginning of the 1900s. It was made of stone, and sculpted on one of the pieces was: 12 June, 1374, the illustrious Francesco 7th of the da Carrara family, prince of Padua, constructor of this building. In 1990, on the first floor of the 18th century residence for the astronomer, a second signature of the prince was found: under the 18th century plaster were the remains of a floral decoration with the initials FC, or Francesco da Carrara. Successively, the remains of the Castle had diverse roles (astronomic observatory, prison, etc.). It was actually used as a prison until the post World War II period, and the Prison Administration of Padua still has some offices in the square Piazza Castello. Its transformation into the Specola had forced architect Cerato to restore what he had called "precipitous fabrications" in his designs. In the new astronomer's house all the walls had been plastered, hiding the remains of earlier decorations. Even the old staircase that led from the ground floor through an antechamber to the tower and the west walls of the castle was partly modified for structural reasons, retaining however the stairs and the supporting columns of the passageway above.